On May 14, 2015, a team of 11 volunteers set out for Wine To Water’s first service trip to Honduras. They flew into the capital city, Tegucigalpa, then took a 15 passenger propeller plane up to the Mosquito Coast, which is in the north-easternmost part of the country, and landed on the dirt runway in Puerto Lempira. There were 8 students from the Appalachian State University WTW Chapter, their advisor and 2 guests from Photoserve, who joined us for this 10-day adventure on this small island. 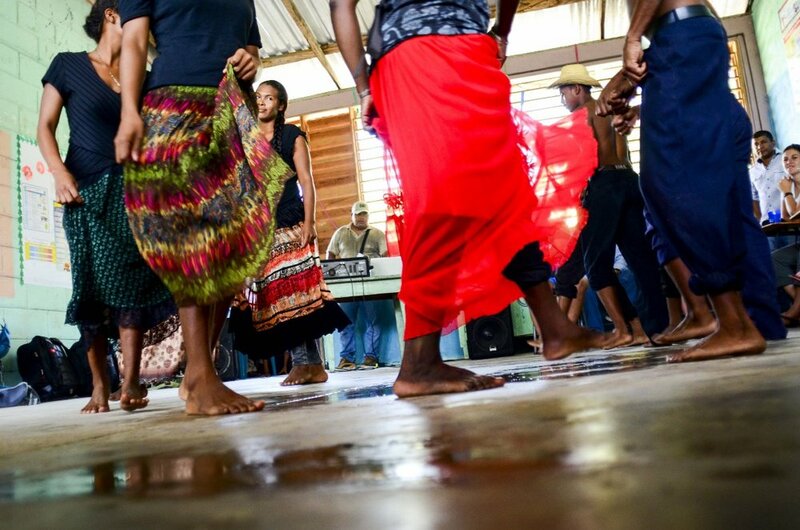 The team was warmly welcomed by the community with lunch, dance performances, and a tour of the island, they then set up their sleeping arrangements for the week. The island was incredibly beautiful; however, there were over 50 broken wells found that have been abandoned for the past 10 years. Several of these wells had trash stuffed down inside, rendering them inoperable. After the tour, the team and our ground partners, Agua Para el Pueblo, knew there was much work to do. The week started with a community meeting to explain who they were and why they were there. With help from the community, the team mapped out which wells would be repaired and where they would dig new ones, and then got to work. Collectively, the team was able to assist in repairing 29 broken wells and dig 2 new wells in 1 week! Of course, work wasn’t the only thing that consumed their time; In between all the drilling and repairing, relationships happened. There is nothing like providing clean water to a community in need, but it is not sustainable unless you provide education along with it. Throughout the week, Milton, the community leader, our ground partners, and the volunteer team were able to teach the importance of clean water and sanitation to each of the homeowners and the school children. Women and children, being the primary water gatherers, no longer have to walk long distances to gather water from the community well. And now over 820 people on the island of Palkaka, Honduras have access to clean water right outside their home! And the children are able to enjoy more time playing with their friends.